Over at the Wellness Natural Pet Food Facebook page you can request a Free sample of their dog food or cat food. For those of you that visit and read the All About Labradors blog on a constant basis, you know that we are fans Wellness dog foods and do recommend them as one of the better dog foods out there. About Wellness: At Wellness®, we do whatever it takes to create the healthiest foods for the pets that depend on us. Food feeds their souls, sustains their lives and protects their bodies. That’s why our diverse team of animal lovers, nutritionists and vets has only one mission: To help you provide your pet a healthy, happy, long life through the power of natural nutrition. True Wellness is about being more than natural. And it’s not about what is left out—no fillers, or artificial ingredients—these are a given for us. True Wellness is about what we put in—a small number of simple, pure, authentic ingredients. We believe this is the way to make superior food for our animals." To get your Free Sample of Wellness Pet Food, visit Facebook and "Like" Wellness Natural Pet Food. Dog samples also come with a $2.00 on-package coupon. Free Sample of Wellness Pet Food is available to the USA only, while supplies last. These will not last very long!! AvoDerm®, makers of one of the better puppy and adult dog foods, is running a contest for you to win 1 Year of Free Pet Food! Twice a year they conduct a drawing where you can win a one year’s supply of AvoDerm® dog food for one dog (they do have a prize for those of you with cats also). 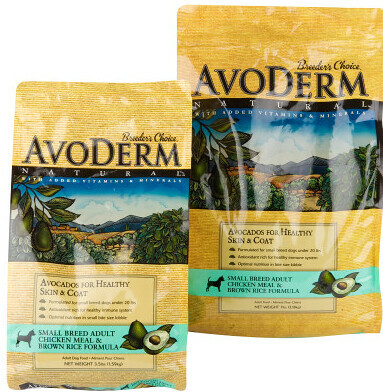 "AvoDerm® premium dog and cat food formulas are loaded with high quality meat proteins, wholesome grains, antioxidant nutrients plus vitamins and minerals for inside health and California avocados for healthy skin and coat on the outside." Head on over to their website and enter the AvoDerm® Free Food Contest for your chance to win a FREE year’s supply of AvoDerm® Natural dog food. Here's a coupon for $2 Off Non-Edible Nylabone Coupon. "Nylabone® manufactures plastic dog chews designed to meet the varying chewing needs of any dog - no matter the size, breed or chew strength." The $2 Off Non-Edible Nylabone Coupon expires 4/15/11. Essential to your dog no matter what the age, is daily activity and exercise. Exercise your dog to help keep weight down, tone muscle, boost energy and ward off disease, not to mention how beneficial it is for your dogs heart and lungs. A lack of exercise, lets our dog's bodies grow soft and weak and will result in boredom and behavioral problems. All dogs require exercise to lead balanced, healthy lives. Keep in mind that no two dogs are the same and each has different exercise needs. The amount of exercise your dog gets will depend on his age, size and weight, with exercise regimens being tailored to meet dog's needs. In general, most dogs should get 1-2 hours of exercise daily to help keep them healthy. Being that our lovable Labrador Retrievers are highly energetic dogs, constant stimulus through exercise is necessary to keep them lean and healthy. Fellow Labrador Retriever owners know that our Labs NEVER, EVER seem to get tired, so plenty of physical as well as mental exercise is a MUST! I like to give my Labrador Retrievers as much exercise as they want without overdoing it (if that's possible with Labradors). Just make sure you watch them for any signs of exhaustion such as lameness, heavy panting and disorientation to name a few. Always be sure your dog has access to fresh, cool water at all times. All dogs need exercise and while taking your dog for long walks is one way to give them much needed exercise there are other ways that are more fun that will allow you to bond with your dog while giving them the exercise they need. Most dogs love playing fetch especially retrieving dogs such as Labrador retrievers, Golden retrievers and many of your spaniel breeds. Easily trained to fetch sticks and balls and bring them back to you these dogs can play this game for hours on end if you are willing to play along. It is the perfect way to give your dog exercise while interacting with them. You don t really use a bird to play bird on a wire or a wire either for that matter. You simply tie a favorite dog toy onto a string and pull it along and the let your dog chase it. Stop immediately once he catches it as playing tug of war can damage a dogs teeth especially that of a puppy. Once the dog drops the toy you can drag it again and he will give chase. Small dogs especially find this game endlessly entertaining. If you live in an area where you are allowed to take your dog swimming this is a great way for both you and your dog to get exercise together. Breeds such as Newfoundlands, Portuguese Water dogs, water spaniels, and Retrievers all love to swim and get wonderful exercise by joining you in the local lake for a dip whenever given the chance. You can even play some fetch games in the water after a swim giving your dog even a longer exercise period. Another great way to exercise your dog both mentally and physically is teaching them a few active tricks such as jumping through hula hoops or over low hurdles. Small dogs like beagles and larger intelligent breeds such as collies really love learning these kinds of tricks but any dog can be taught them with a little patience. Though you will need a leash for most dogs for this kind of activity nature hikes with your dog offers the same exercise as walking him on a lead with a little less boredom for you. Exploring wooded and other nature areas together can be fun for you both and introduces your dog to new scenery to keep him mentally alert as well as physically exercised. Taking him along when jogging will also provide additional exercise at a faster clip for him to enjoy. While one does not normally think of obedience training as exercise it does provide both mental and physical exercise for your dog. He exercisers many muscles as he learns to sit, heel, run, walk and lay at your command as well as finding learning the signals mentally challenging. In addition you can teach your dog other commands such as rolling over and even crawling. Exercising your dog does not have to be boring. There are a lot of fun ways you can exercise your dog that you both will find satisfying. Article by Kelly Marshall of http://www.ohmydogsupplies.com/, check out our selection of designer dog beds and cool dog clothes. Here are a couple of videos that mention other methods of exercise with toys that you might not have known about. The K9 Cruiser Bicycle Leash is a quick and easy way to exercise both you and your dog. "The K9 Cruiser is an excellent way to increase muscle conditioning, improve overall appearance, build endurance, improve gait, and reduce the chance of injuries." The Egge Dog Toy is an unique "egg" shaped ball that wobbles this way and that. This super tough plastic dog toy with the unique shape prevents most dogs from clamping down on the toy, driving them crazy and providing hours of entertainment. Great for large dogs like our Labrador Retrievers! Another similar product is the Jolly Egg Dog Ball. Boomer Ball - intended for soccer-style play, to encourage healthful exercise as an alternative to destructive chewing, pacing, and other undesirable behaviors plus animal enrichment. Our favorite makers of dog toys and products. We mention Kong frequently here on All About Labradors. Here's a review for the Kong Wobbler that we had previously posted on this blog. Grab your doggies and get out there. The exercise will do wonders for your four legged friend! Be advised, no toy is indestructible. Supervision should be provided when your dog plays with any dog toy. If you find any broken or loose pieces on dog toys, you should discard the toy. You don't want to risk the problems associated with your dog swallowing parts of a toy! 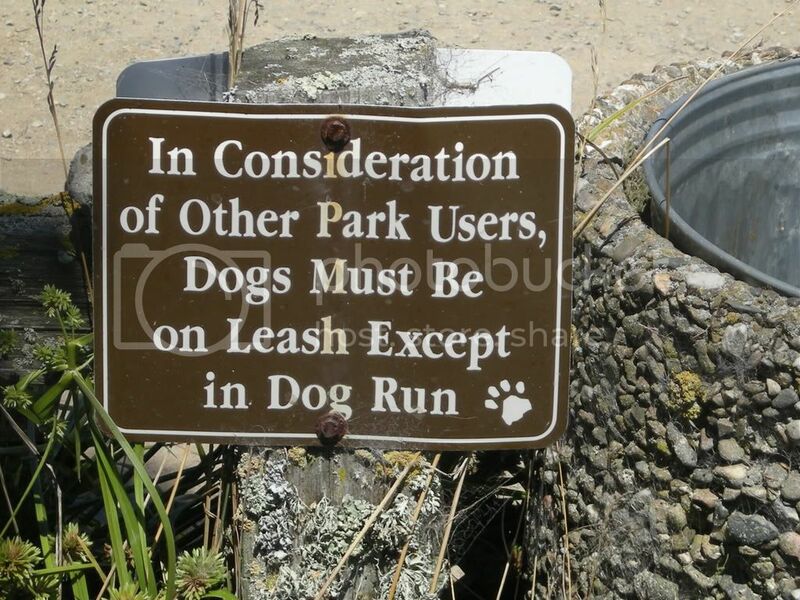 Dog Owners: Leashed by Park Fees? A new trend is cropping up in dog parks across the country: off-leash fees. Many parks offer enclosed areas where dog owners can bring their pets for exercise and socialization, free from the constraints of leash and lead. Often, these parks require little more from each dogs' owner than an agreement to pick up after their pet. But that may quickly become the exception rather than the rule. After all, those dog waste bags and pet waste stations don't pay for themselves, and many communities are looking at dog parks as an additional source of income. Many dog owners are opposed to the idea of paying to use off-leash areas. Some say they can't afford the extra expense – fees generally seem to range from $40-100 yearly – and are concerned that their pets will have to miss out on exercise and socialization. Additionally, many owners feel that they pay enough already in pet licensing fees. Still others are worried that the fees won't actually be used to maintain the parks, but will instead go towards other programs which they do not utilize. Of course, each community operates its dog parks in its own way; according to various news stories around the Internet, some dog parks would not even exist without the revenue generated by user fees, while others are merely looking to cash in. Not all owners oppose the fees, though. At least some dog-lovers think that a reasonable fee is a small price to pay for canine happiness, and those who live in areas where the fees will be folded back into the dog parks are looking forward to the improvements that will be made, including additional fencing, equipment and pet waste stations. Indeed, in an online poll at WickedLocal.com, roughly half or all respondents supported usage fees for dog parks. In the end, this seems to be a local issue. A community with a variety of very nice parks, which charges a reasonable fee, shouldn't have a problem convincing dog owners to chip in. In larger cities, where there are limited options for doggie exercise, owners should factor park fees into the total cost of pet-ownership, just liked food and veterinary care. On the other hand, a community with mediocre parks or very high fees may end up defeating itself if owners choose to find other ways of exercising their pets. Thanks goes out to Kristina for this guest post. As more and more new findings about your diet come to the surface, many a dog owner will begin to consider changing the diet to the best available so the dog will have good health and live to a ripe old age. Step 1: During such times as changing owner or moving to a new location, it's best not to change the diet so as to avoid too much unnecessary emotional strain on the dog. Once the dog becomes accustomed to the new owner or living environment, then it would be the right time to change the dog's diet as planned. 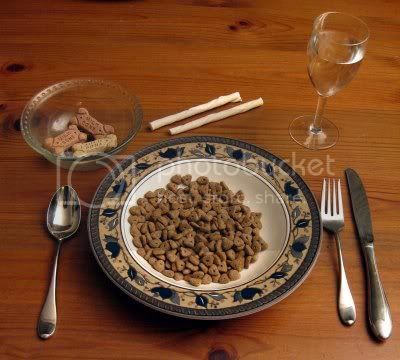 Step 2: When it comes to changing the dogs diet, it should be done by replacing only 25% of the old food with the new. Most dogs will not be able to notice any difference if the old and the new are mixed well enough. They should eat the new mixture as well as the old diet. Although some might not get used to the new diet initially, patience should be taken to allow for the break-in period to complete. It has taken the dog many months to get used to its old diet; therefore, for the dog to accept a new one it might sometimes take as long. As soon as the dog is eating 25% of the new mixture of diet, then it'd be safe to proceed to Step 3 as shown below. Step 3: Mix and replace 50% of the old diet with the new this time and make a little less effort to hide the new diet from the dog as it should be more receptive to the new food presented in the new mixture now. When this is evident, proceed to Step 4. Step 4: This time, it should be easily understood that 75% of the new food be substituted with the old one. And make an even lesser effort to hide the new food from the dog. At this stage, the dog should accept this newly mixed diet in an "as-a-matter-of-fact" manner. It should eat the dog food without any sign of hesitation when first fed. Step 5: At this point, the dog should be accepting the newly mixed and replaced diet without any problem at all. If the dog accepted the first feeding at Step 4 easily, this final step should just be "a piece of cake." Just like humans, dogs are uniquely different and some are bound to require more patience and attention. Therefore, don't become discouraged too easily when the dog is not fitting into the new diet in the beginning. After all, changing a dog's diet is often a time consuming process that should be done with care and understanding. Subject: My Labrador Retriever Puppy is Teething... what can I do? Hello Reese and thank you for visiting the All About Labradors blog. Using a small amount of Orajel directly applied to the area where Nori's teeth are bother him won't hurt but I would try other remedies before I used it. What I would recommend is to give Nori things to chew on to help massage his gums and help his teeth break through. 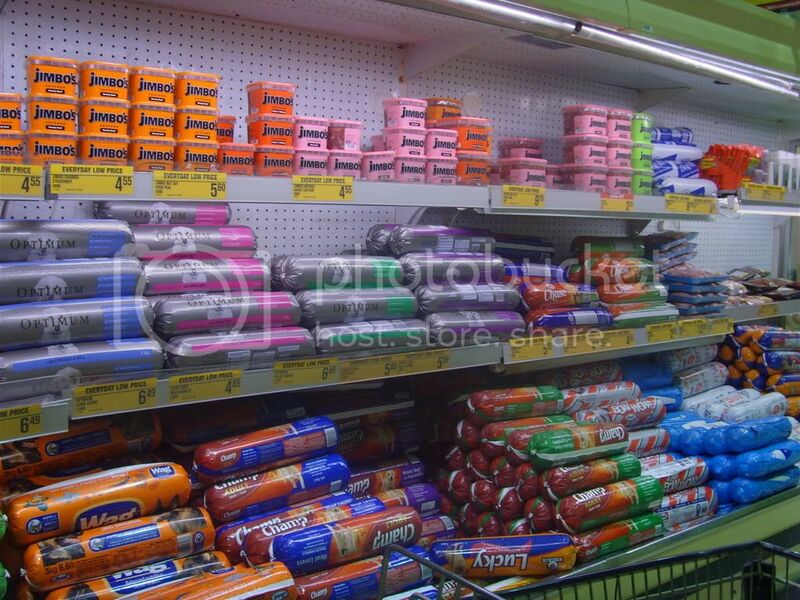 There are plenty of chew toys available on the market which will help to soothe Nori's gums and help him feel better. Chilly Bone is a soft, freezable, canvas dog toy that will help to stimulate your dog's teeth and gums. Nylabone makes plenty of flexible puppy teething bones to help ease the pain of teething. Our favorite maker of dog toy products, Kong (Goodie Bone Toys, Puppy Teething Stick Dog Toy) are designed to exercise growing jaws and assist the teething process in puppies. Ice cubes - right there in your home freezer, sure to provide entertainment as well as relief for Nori. Nori's teething problems will pass quickly. By the time he is seven to eight months old, he should have a full set of adult teeth. Paramount Alarm is offering Free Pet Alert Window Decals. We've had pet alert decals from other companies listed on the All About Labradors blog before and we will continue to post them as we find them, as we believe these are extremely important to have on your home windows for the safety of our beloved Labrador Retrievers. In case of fire, protect your pets with a Free Pet Alert Window Decal. 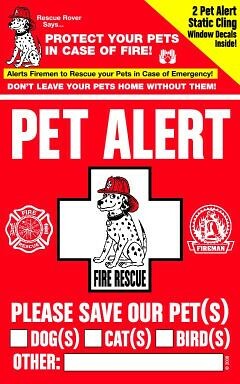 "Firefighers are familiar with pet alert window clings. Knowing the number of pets in a household helps rescuers locate your pets and provides important information that may be critical to firefighters when rescuing pets." Chocolate lab puppies are delightful dogs that make wonderful pets. Besides being adorable, these labs are faithful and loving animals that have personalities suitable for all age groups, including very young children. Typical places to find chocolate lab puppies include animal shelters, puppy mills, and breeders. It should be noted that before someone brings a lab into his or her home, he or she should make preparations including buying equipment for the dog; finding reputable groomers and vets; and locating a trainer in the event that one is needed. Chocolate Labrador puppies can be found at animal shelters, puppy mills, as well as from reputable breeders. Local animal shelters sometimes have labs available for adoption. Many purebred dogs can in fact be found at animal shelters. By adopting a chocolate lab from a shelter, you'll be helping a dog in need as well as bringing a potentially lovely pet into your home. Puppy mills should be avoided at all costs. A number of dogs placed for sale online, as well as may of those sold in pet shops, come from puppy mills. Employees from puppy mills typically do not allow prospective buyers to see their kennel areas and on average do not have vet records for their dogs. The goal of such places is sadly to make profits over the dogs' health and well-being, and a lot of the dogs from these mills unfortunately end up having medical and other issues. Reputable Labrador retriever breeders are perhaps your best resource when searching for chocolate lab puppies. Breeders with good reputations take extra care to ensure that their dogs are healthy and well cared for and are dedicated to producing well rounded hunting, competition, and family dogs. When looking for a Labrador retriever as a hunting companion, be sure to seek out breeders who only breed dogs with a field trial or hunt test background. Many reputable breeders will also have an adoption program in place. Once the decision is made to bring a chocolate lab puppy home, and one is selected, the prospective owner needs to purchase equipment, find a reputable vet and dog groomer, and locate a dog trainer. The equipment needed includes a bed, toys, dog food, a leash, a collar, food bowls, nail clippers, and a first aid kit. While the new owner is setting up his or her home with all of these new items, he or she also needs to make sure that the house is puppy proofed in anticipation of the new arrival. A reputable vet and dog groomer also both need to be found. Vet check-ups, as well as an appointment to have the puppy altered, need to be made as soon as possible. Waiting too long for puppies to be spayed or neutered increases their chances of getting different cancers. Where groomers are concerned, it is possible to locate one through a vet office or animal shelter. It is very important to find a groomer who has a good reputation and who works well with animals. Perhaps the prospective owner can make a surprise visit to a groomer to see how well its employees deal with animals. Furthermore, it is best to find a groomer that does not use sedatives to calm animals down. A dog obedience school should be looked into as well in the event that it is needed. Many vets, shelters, and pet shops offer obedience classes. In addition, before the chocolate lab is even brought home, rules should be devised including commands and training the dog to go outside when necessary. How To Locate And Care For Chocolate Lab Puppies by Russ Riedle. Another day, another free sample. This one is for a Free sample of Purina One BeyOnd dog or cat food. "Purina Brand ONE® beyOnd™ Pet Food Positively good for your pet and the world you share. 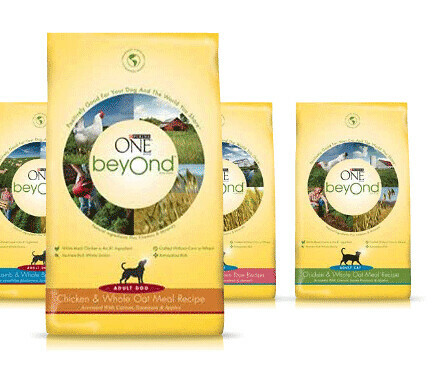 Purina ONE(R) beyOnd is pet food that celebrates and respects nature and natural ingredients. Purina One Beyond is the first Purina product to use packaging made from at least 92% renewable materials." If you would like to try this product, visit the Walmart website to request your Free Purina One BeyOnd Sample. While supplies last. Limit (1) sample per household. Samples are only available to consumers in the United States. Walmart is offering Free samples of Healthident Dog Dental Treats. About the Free Healthident Dog Dental Treats Sample - "HealthiDent™ Dental Treats for Dogs are a fun way to help reduce tartar in your dog's mouth.+ Combining natural flavors with the plaque-fighting agent. A fun way to give your dog fresh breath and a brighter smile. Healthident Dog Dental Treats are clinically proven to reduce plaque by 21% and tartar by 65%. The Free Healthident Dog Dental Treats Sample is available to US residents while supplies last. One sample per household.